In a nutshell, scenes are collections of sources that are arranged in XSplit Broadcaster. The variety of Sources you can add allows you to achieve a variety of effects, limited only by your creativity and the needs of your stream. To create a new scene, click on the + button found in the scene list on the lower-right corner. You can rearrange the order of scenes through drag and drop. You can also create a new scene as well as duplicate, save, load or delete an existing one from the File menu. You can change the name of your currently active scene on the bar above your source list. Animated transition effects can be applied when switching between scenes. To choose which transition style is applied, click the drop-down menu on top of the scene list. The timing of the effect can also be changed at the bottom of this list. You can set favorite transition styles and timings by clicking on the icon. You'll be able to quickly access them through the arrow beside the icon. Favorited transitions can also be accessed and used to switch to specific scenes by right-clicking on the them. Stingers are short video clips that can be used to introduce, end or transition between various scenes of your presentation. Stinger transitions can have alpha transparency which allow content from the scenes to still be visible while the stinger plays. Only a few video formats support alpha transparency such as MOV and WEBM. Since MOV with alpha channels are usually large files, XSplit Broadcaster uses WEBM as the native format for stingers. MOV videos and sequential PNG images can easily be converted to the native WEBM format and added to the Transitions menu using the Add Stinger wizard. Existing WEBM with alpha can also be used with the Add Stinger wizard to instantly add them to the Transitions menu. Click to browse and select your source file. 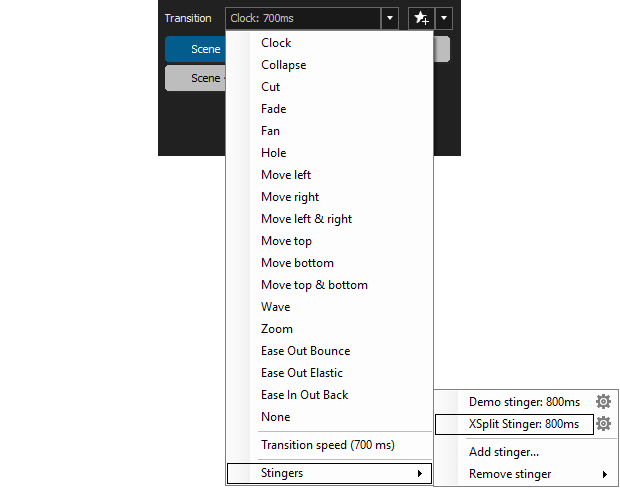 You can change the Stinger name and Transition point if you prefer. You can access additional settings as well by enabling Show advanced settings. For WEBM source files, click Add stinger. For MOV and PNG source files, click Convert and add stinger. XSplit will automatically convert MOV or PNG sequence files to a WEBM file. You will be prompted once conversion is complete and successfully added, and you can find your newly added stinger under the Stingers menu. You can also convert MOV and sequential PNG files to a stinger compatible WEBM format using the Stinger Creator extension.